Fox News Bans Anti-Nazi Ad - But Uses Nazi Imagery Against Planned Parenthood - The National Memo - Smart. Sharp. Funny. Fearless. Fox News viewers — particularly those who watch the prime-time lineup of Tucker Carlson, Ingraham, and Sean Hannity — are no strangers to xenophobic or sexist content, racist dog whistles, and even talking points borrowed from white nationalists. 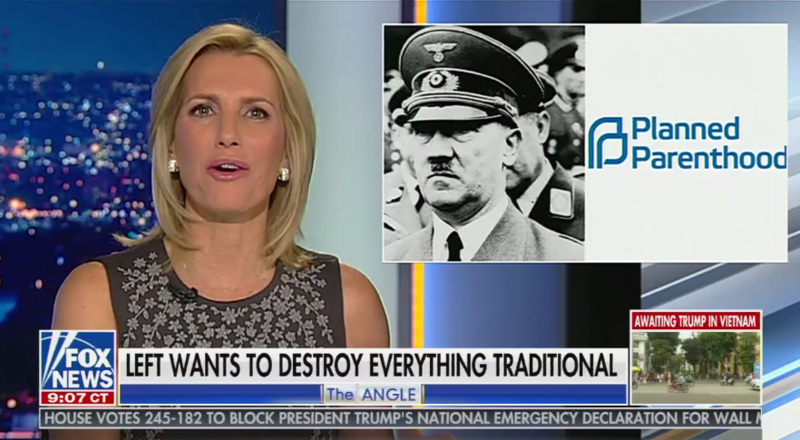 And this isn’t the first time that Ingraham or other Fox News figures have asserted inaccurate and harmful comparisons between Planned Parenthood and Nazis. However, Ingraham’s choice of talking points and on-screen imagery raises some questions in light of Fox News’ recent decision to reject an advertisement warning about the dangers of fascism and Nazi ideology. There are consequences to allowing this kind of extreme rhetoric to continue unchecked that extend beyond the negative impact on advertisers for having their products associated with vitriol like Ingraham’s. Anti-abortion violence and harassment have been on the rise in recent years — a trend fueled in part by the extreme rhetoric of right-wing media figures, whose anti-choice talkings points are echoed by the president. IMAGE: From A Night At The Garden, Marshall Curry’s Oscar-nominated short about an infamous pro-Nazi German Bund rally at Madison Square Garden on February 20, 1939.